In a small New England town, four elderly men form what they call the 'Chowder Society', regaling themselves with the telling of scary ghost stories. Membership in the club, in fact, requires that one present such a story. The four old friends consist of Ricky Hawthorne (Fred Astaire), a lawyer, and his partner Sears James (John Houseman), along with Dr. John Jaffrey (Melvyn Douglas) and Edward Charles Wanderley (Douglas Fairbanks, Jr.), a successful businessman.When Edward's son, David, living in New York, falls from a window after the girl he's sleeping with turns suddenly into a hideous demon, Edward grieves. His other son, Don (Craig Wasson), a college professor who's fallen on hard times, shows up in town, not getting a great reception from Edward, who always preferred the other, more ambitious son. Now begins the fun as we discover that Don was previously in a relationship with Davids girlfriend (played by Alice Krige) and unfortunately it turns out that she is no longer human but a ghost out for revenge on the Chowder Society and those who hurt her. Based upon the Peter Straub novel of the same name, this movie has gone on to earn itself a cult following and rightfully so. Though it doesn't follow the book completely it does do a fair job at giving us the scares and jolts. The make up for Alice Krige is amazing and stands out to this day, especially her ghostly transformation scenes. 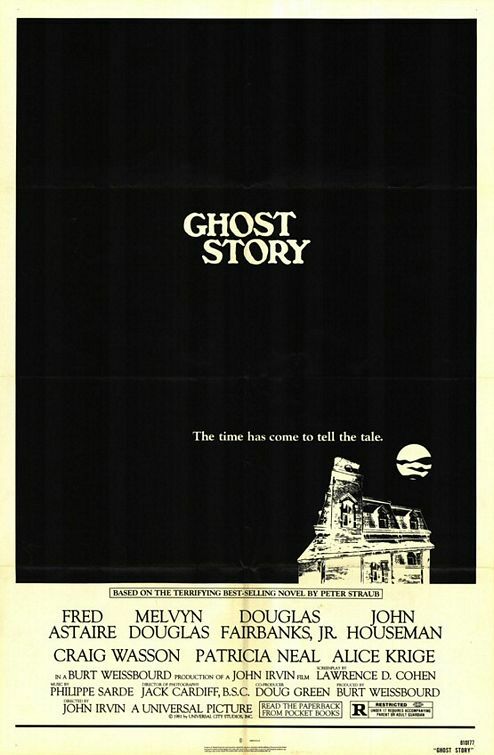 Well acted and directed throughout 'GHOST STORY' is most notable for the fact that some of the Chowder Society actors were making their very first foray in to the world of horror. A perfect film to watch on those thundery stormy nights.